ImmunoGlo™-Tox HT is a general use functional immune cell proliferation assay where the investigator employs their own culture reagents and protocol for any type of immune cell. ImmunoGlo™ Tox HT TCP Assay Kits include specific cocktails to stimulate functional T-lymphocytes. ImmunoGlo™ Tox HT BCP is specific for stimulating functional human B-lymphocytes. In vitro high-throughput immunotoxicity screening. In vitro high throughput lymphocyte proliferation screening. Specialized toxicity assays for T- and B-lymphocytes. Development of drugs and immunotherapies using gene targeting, e.g. CRISPR-Cas9. Non-radioactive assay incorporating proven high-throughput ATP bioluminescence technology. Instrument-based, quantitative and fully standardized allowing comparison of results over time. Can be validated for GLP studies. More sensitive than WST-1, CSFE and other absorbance or fluorescence assays. Available in 96- or 384-well plate formats. 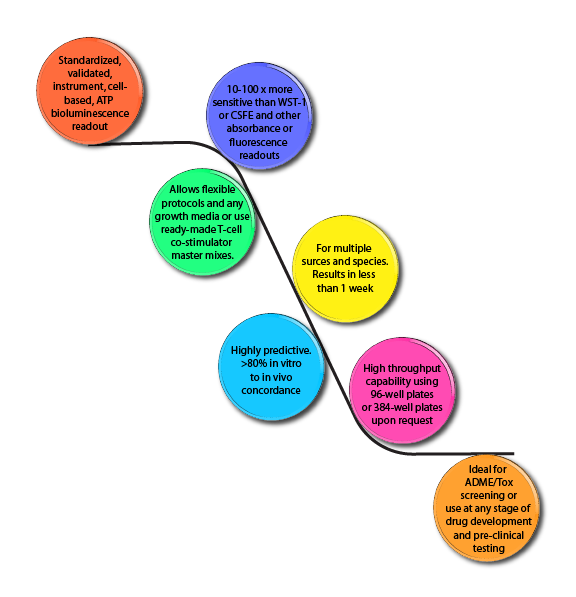 Multiplexing capability to incorporate flow cytometry, cytokine release and other assay readouts for additional information from the same sample. Simple, time efficient and cost effective. 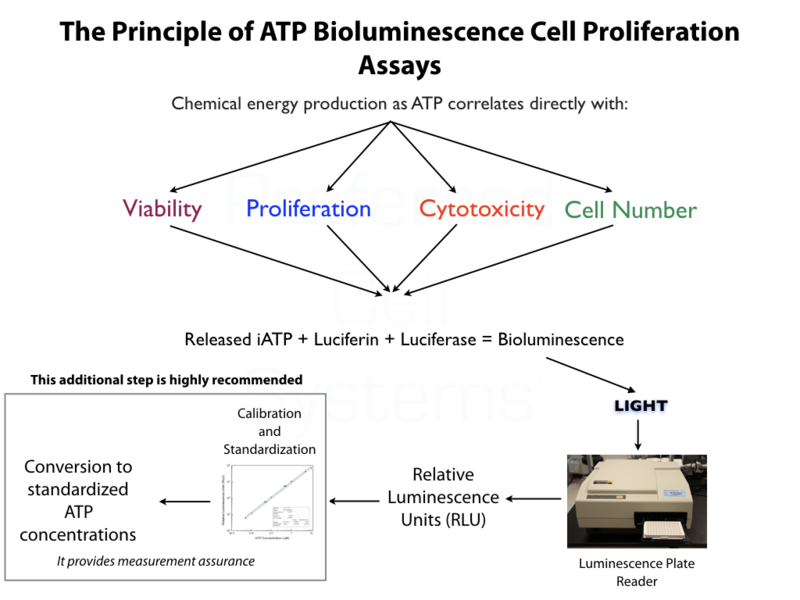 All ATP bioluminescence assays kits from Preferred Cell Systems™ include an ATP standard(s) and controls. Performing the ATP standard curve and controls is highly recommended. The controls are used to calibrate the instrument and the ATP standard is used to standardize the assay. The values obtained provide the measurement assurance parameters that allow you, the user, to ensure that the results obtained can be trusted. 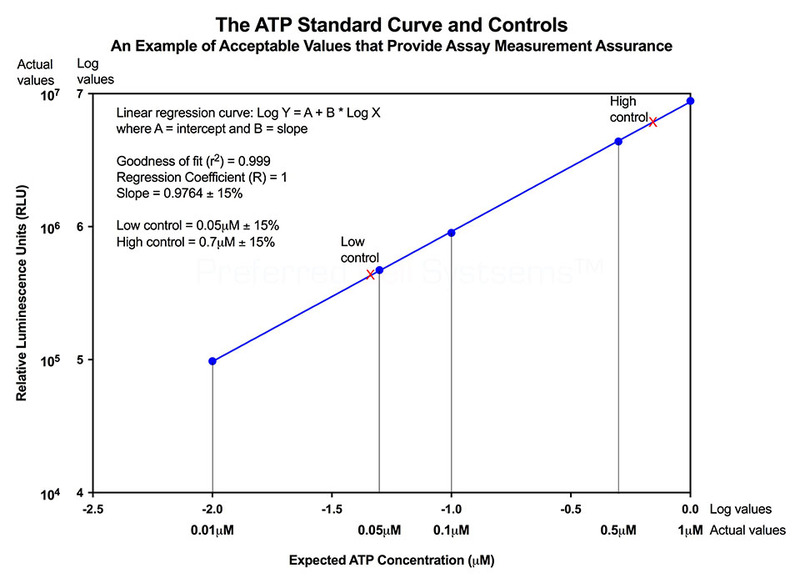 An example of an ATP standard curve and control results are shown in the diagram below and actual values for the kit being used are given in the Technical Manual. If the values obtained are within the ranges given in the Technical Manual, the user can process the samples knowing that the results will be trustworthy. Luminescence or multimode plate reader with "glow" luminescence measuring capability. When ordering ImmunoGlo™-Tox HT, simply click on the catalog number in the table below and you will be taken directly to the desired product. Preferred Cell Systems™ is the exclusive manufacturer and supplier of all reagents and in vitro assays originally produced by HemoGenix. We are fully committed and guarantee the highest quality of products and customer service. For contract research services, please visit the HemoGenix website: www.hemogenix.com. For a list of international distributors, please click here.